ErasysApp IMOMESIC: This project aims to obtain systems understanding on how the integration of metabolism and signalling is altered in liver cancer cells compared to the healthy liver. Talk at the Cancer Centre Amsterdam (CCA) Bioinformatics meeting on May 12, 1017 in Amsterdam, the Netherlands. Title: Metabolism in disease: target the system! Jurgen Haanstra studied Biomedical Sciences at Utrecht University, with one internship on the impact of stress on food-intake regulating neuropeptides and another on the downstream effects of MAP kinase signalling. He graduated in 2002 and started as a PhD student at VU University in the lab of Dr. Barbara Bakker and Prof. dr. Hans Westerhoff on network-based drug design against glycolysis in the tropical parasite Trypanosoma brucei. In this project he combined mathematical modelling and wet lab experimentation. During this time, he spend 6 months in Heidelberg to study the control and regulation of trypanosome gene expression. After his PhD, Haanstra was a post-doctoral researcher in the Hematology department of the Erasmus MC in Rotterdam, where he focussed on elucidating the molecular mechanism of leukemogenesis after bone marrow failure. In 2011, he returned to trypanosomes and again combined mathematical modelling with wet lab experiments. 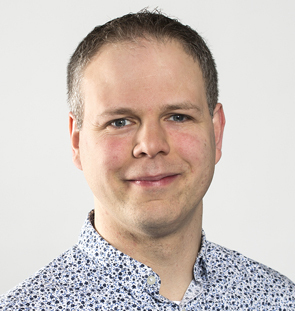 He divided his time between his post-doc position at the UMCG Groningen and his position as a guest researcher in the department of Molecular Cell Physiology at VU University Amsterdam and worked on redox metabolism of T. brucei and differential-based drug design. In the latter part of his work he aimed to find drug targets within metabolism that, when targeted, affect the parasite more than the mammalian host. Three times he has hosted the AIMMS-sponsored annual microsymposium on ‘Parasite/Trypanosmatid Metabolism, Drug Design and Glycosomes’ at the VU. Nilsson, A, Haanstra, JR, Teusink, B, Nielsen, J. Metabolite Depletion Affects Flux Profiling of Cell Lines. Trends Biochem. Sci. 2018;43 (6):395-397. doi: 10.1016/j.tibs.2018.03.009. PubMed PMID:29656822 . Bosdriesz, E, Wortel, MT, Haanstra, JR, Wagner, MJ, de la Torre Cortés, P, Teusink, B et al.. Low affinity uniporter carrier proteins can increase net substrate uptake rate by reducing efflux. Sci Rep. 2018;8 (1):5576. doi: 10.1038/s41598-018-23528-7. PubMed PMID:29615663 PubMed Central PMC5883050. Haanstra, JR, Gerding, A, Dolga, AM, Sorgdrager, FJH, Buist-Homan, M, du Toit, F et al.. Targeting pathogen metabolism without collateral damage to the host. Sci Rep. 2017;7 :40406. doi: 10.1038/srep40406. PubMed PMID:28084422 PubMed Central PMC5234033. Antwi, EB, Haanstra, JR, Ramasamy, G, Jensen, B, Droll, D, Rojas, F et al.. Integrative analysis of the Trypanosoma brucei gene expression cascade predicts differential regulation of mRNA processing and unusual control of ribosomal protein expression. BMC Genomics. 2016;17 :306. doi: 10.1186/s12864-016-2624-3. PubMed PMID:27118143 PubMed Central PMC4845500. Haanstra, JR, Bakker, BM. Drug target identification through systems biology. Drug Discov Today Technol. 2015;15 :17-22. doi: 10.1016/j.ddtec.2015.06.002. PubMed PMID:26464086 . Haanstra, JR, González-Marcano, EB, Gualdrón-López, M, Michels, PA. Biogenesis, maintenance and dynamics of glycosomes in trypanosomatid parasites. Biochim. Biophys. Acta. 2016;1863 (5):1038-48. doi: 10.1016/j.bbamcr.2015.09.015. PubMed PMID:26384872 . Alemdehy, MF, Haanstra, JR, de Looper, HW, van Strien, PM, Verhagen-Oldenampsen, J, Caljouw, Y et al.. ICL-induced miR139-3p and miR199a-3p have opposite roles in hematopoietic cell expansion and leukemic transformation. Blood. 2015;125 (25):3937-48. doi: 10.1182/blood-2014-11-612507. PubMed PMID:25778535 . Haanstra, JR, Bakker, BM, Michels, PA. In or out? On the tightness of glycosomal compartmentalization of metabolites and enzymes in Trypanosoma brucei. Mol. Biochem. Parasitol. 2014;198 (1):18-28. doi: 10.1016/j.molbiopara.2014.11.004. PubMed PMID:25476771 . Szöör, B, Haanstra, JR, Gualdrón-López, M, Michels, PA. Evolution, dynamics and specialized functions of glycosomes in metabolism and development of trypanosomatids. Curr. Opin. Microbiol. 2014;22 :79-87. doi: 10.1016/j.mib.2014.09.006. PubMed PMID:25460800 . Fadda, A, Ryten, M, Droll, D, Rojas, F, Färber, V, Haanstra, JR et al.. Transcriptome-wide analysis of trypanosome mRNA decay reveals complex degradation kinetics and suggests a role for co-transcriptional degradation in determining mRNA levels. Mol. Microbiol. 2014;94 (2):307-26. doi: 10.1111/mmi.12764. PubMed PMID:25145465 PubMed Central PMC4285177. Achcar, F, Fadda, A, Haanstra, JR, Kerkhoven, EJ, Kim, DH, Leroux, AE et al.. The silicon trypanosome: a test case of iterative model extension in systems biology. Adv. Microb. Physiol. 2014;64 :115-43. doi: 10.1016/B978-0-12-800143-1.00003-8. PubMed PMID:24797926 PubMed Central PMC4773886. Leroux, AE, Haanstra, JR, Bakker, BM, Krauth-Siegel, RL. Dissecting the catalytic mechanism of Trypanosoma brucei trypanothione synthetase by kinetic analysis and computational modeling. J. Biol. Chem. 2013;288 (33):23751-64. doi: 10.1074/jbc.M113.483289. PubMed PMID:23814051 PubMed Central PMC3745322. Pieretti, S, Haanstra, JR, Mazet, M, Perozzo, R, Bergamini, C, Prati, F et al.. Naphthoquinone derivatives exert their antitrypanosomal activity via a multi-target mechanism. PLoS Negl Trop Dis. 2013;7 (1):e2012. doi: 10.1371/journal.pntd.0002012. PubMed PMID:23350008 PubMed Central PMC3547856. Verhagen-Oldenampsen, JH, Haanstra, JR, van Strien, PM, Valkhof, M, Touw, IP, von Lindern, M et al.. Loss of ercc1 results in a time- and dose-dependent reduction of proliferating early hematopoietic progenitors. Anemia. 2012;2012 :783068. doi: 10.1155/2012/783068. PubMed PMID:22701168 PubMed Central PMC3371671. Haanstra, JR, van Tuijl, A, van Dam, J, van Winden, W, Tielens, AG, van Hellemond, JJ et al.. Proliferating bloodstream-form Trypanosoma brucei use a negligible part of consumed glucose for anabolic processes. Int. J. Parasitol. 2012;42 (7):667-73. doi: 10.1016/j.ijpara.2012.04.009. PubMed PMID:22580731 . Bindels, EM, Havermans, M, Lugthart, S, Erpelinck, C, Wocjtowicz, E, Krivtsov, AV et al.. EVI1 is critical for the pathogenesis of a subset of MLL-AF9-rearranged AMLs. Blood. 2012;119 (24):5838-49. doi: 10.1182/blood-2011-11-393827. PubMed PMID:22553314 PubMed Central PMC3382941. Beekman, R, Valkhof, MG, Sanders, MA, van Strien, PM, Haanstra, JR, Broeders, L et al.. Sequential gain of mutations in severe congenital neutropenia progressing to acute myeloid leukemia. Blood. 2012;119 (22):5071-7. doi: 10.1182/blood-2012-01-406116. PubMed PMID:22371884 . Haanstra, JR, Kerkhoven, EJ, van Tuijl, A, Blits, M, Wurst, M, van Nuland, R et al.. A domino effect in drug action: from metabolic assault towards parasite differentiation. Mol. Microbiol. 2011;79 (1):94-108. doi: 10.1111/j.1365-2958.2010.07435.x. PubMed PMID:21166896 . Wölfler, A, Danen-van Oorschot, AA, Haanstra, JR, Valkhof, M, Bodner, C, Vroegindeweij, E et al.. Lineage-instructive function of C/EBPα in multipotent hematopoietic cells and early thymic progenitors. Blood. 2010;116 (20):4116-25. doi: 10.1182/blood-2010-03-275404. PubMed PMID:20807890 . Haanstra, JR, van Tuijl, A, Kessler, P, Reijnders, W, Michels, PA, Westerhoff, HV et al.. Compartmentation prevents a lethal turbo-explosion of glycolysis in trypanosomes. Proc. Natl. Acad. Sci. U.S.A. 2008;105 (46):17718-23. doi: 10.1073/pnas.0806664105. PubMed PMID:19008351 PubMed Central PMC2584722. If you are interested in an internship look at our Internships page for the available openings and contact me.